This entry was posted in Uncategorized on September 28, 2016 by bperet. A must-read analysis of the Nonprofit Industrial Complex. The Nonprofit Industrial Complex: an Accessory to the Crime of Imperialism. “This is an open-ended exploration [carried out by Friends of Syria] of some of the outside figures offering assistance to the Syrian Support Group (SSG). These figures have assisted in the granting of a license that enabled the Group to effectively send arms and money to the ‘Free Syrian Army’. The license was provided by the US State Dept’s oddly named ‘Office of Terrorism Finance and Economic Sanctions Policy’. Part of the Office of Terrorism Finance’s stated remit is to coordinate: “efforts to create, modify, or terminate unilateral sanctions regimes as appropriate to the changing international situation, such as Iran, Syria, and Libya.” The license was granted in July 2012, based on a May application letter—a remarkably short time considering the nature of the SSG’s objectives and the complexities of the situation. This entry was posted in Uncategorized on January 17, 2016 by bperet. Avaaz: clicktivist heroes or Soros wolf in woolly disguise? Source: Avaaz: clicktivist heroes or Soros wolf in woolly disguise? This entry was posted in Uncategorized on November 25, 2015 by bperet. 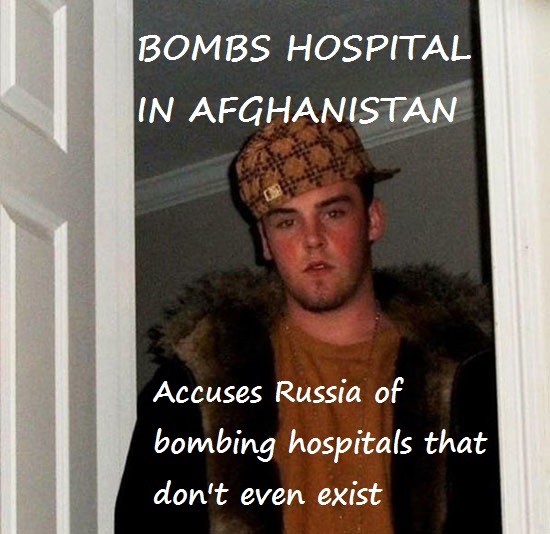 Since the bombing of the Doctors without Borders hospital in Kunduz, Afghanistan by U.S. forces, the United States government has actually had the gall to blame Russia for striking six hospitals in Syria. It only gets worse when you realize that the U.S. government tried nearly every trick in the book to dodge any responsibility for the tragedy which left 22 people dead. 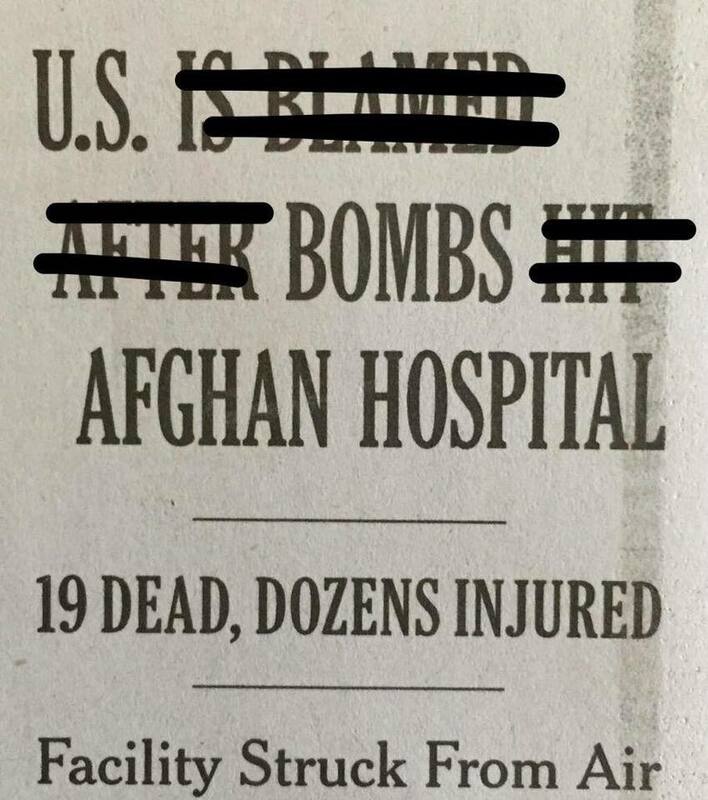 The U.S. has changed their story at least four times, refusing to accept responsibility at first, and later claiming that the hospital was “mistakenly struck” by U.S. forces, then saying that the hospital was hit because Taliban fighters were firing guns from the hospital, and Afghan forces had requested the strike after being engaged in a “tenacious fight” for the city. The outrage that resulted around the world over the bombing of the hospital must have given some eager young PR intern at the U.S. State Department the inspiration to come up with an even worse atrocity – bombing six hospitals! By the Russians! Reuters: The United States has “operational information” that leads U.S. officials to believe Russian military aircraft hit a hospital while carrying out bombing raids in Syria, the State Department said on Thursday. Since the start of the Russian bombing campaign on Sept. 30, various reports from media and civilian groups have charged that Russian warplanes have hit hospitals with their air strikes. As can be seen in the cringeworthy, deeply embarrassing videos below, the “operational information” comes, as usual, from “Syrian NGOs on the ground” and “open source reporting” – which means they still get their information from the usual State Department sources: George Soros-funded NGOs like the White Helmets, the Syrian Observatory for Human Rights (a man who lives in Coventry, England), Bellingcat and the Brown Moses Blog (unemployed office worker Eliot Higgins), and of course open source reporting – the Internet. In other words, when people ask the U.S. State Department how they know that Russia bombed six hospitals in Syria, the answer is – we read it on the Internet. Elizabeth Trudeau (Director, Office of Press Relations. U.S. Department of State), the latest in a long line of U.S. State Department spokespersons with the unenviable job of explaining American foreign policy, refused to give any details on the locations of hospitals in Syria allegedly bombed by Russia. This is due to the fact that these hospitals never existed. As Stuart Hooper of 21st Century Wire reports, five of the six Syrian hospitals that the U.S. claims were hit by Russia do not exist, and the sixth hospital (the one that actually exists) is still standing and shows no signs of being hit or attacked in any way. A tip of the hat to AP reporter Matt Lee for keeping it real at the State Department press briefings! This entry was posted in Uncategorized on November 5, 2015 by bperet. The British propaganda machine has been hard at work attacking Assad from day one, and started this lunatic neocon line that “Obama is being weak” with Syria and needs to follow through on his idiotic “red line” threat / boast. This is our second look at the work of Robert Stuart, concerning the BBC Panorama documentary Saving Syria’s Children. (go here for our first instalment). When did the alleged chemical attacks actually occur? Why do accounts of the timing differ so widely? And why did producer Darren Conway become defensive and incoherent when asked one simple question? This entry was posted in Uncategorized on November 2, 2015 by bperet. This entry was posted in Uncategorized on October 26, 2015 by bperet. Mystery Revealed: What frightened the USS Donald Cook so much in the Black Sea? Sergio says: Dear Lada, I found this article on: What frightened the USS Donald Cook so much in the Black Sea? http://www.voltairenet.org/article185860.html. Did you know of this and do you have any comments. Thanks, Sergio. Thank you, Sergio, for an interesting link and question. Yes, I have lots to say on this. There were some materials in the Russians press, although this information was diligently covered up and suppressed in the US and West in general. 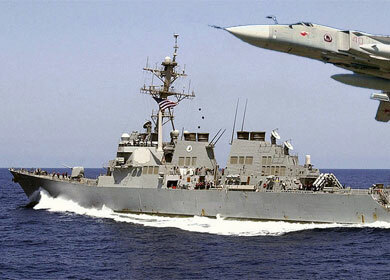 Quote from the article in Voltairenet.org: “The State Department acknowledged that the crew of the destroyer USS Donald Cook has been gravely demoralized ever since their vessel was flown over in the Black Sea by a Russian Sukhoi-24 (Su-24) fighter jet which carried neither bombs nor missiles but only an electronic warfare device. This entry was posted in Uncategorized on October 20, 2015 by bperet. It is an excellent rule to be observed in all disputes, that men should give soft words and hard arguments; that they should not so much strive to vex as to convince each other. A blog by Paul Likoudis. News and views for people in the reality-based community.